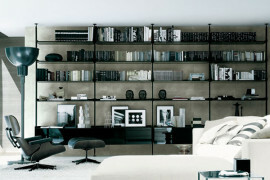 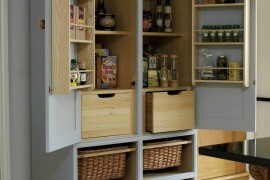 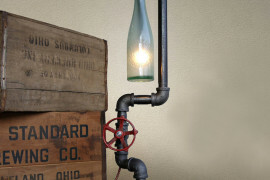 There’s nothing quite like taking an old object and turning it into something new to use somewhere in your home. 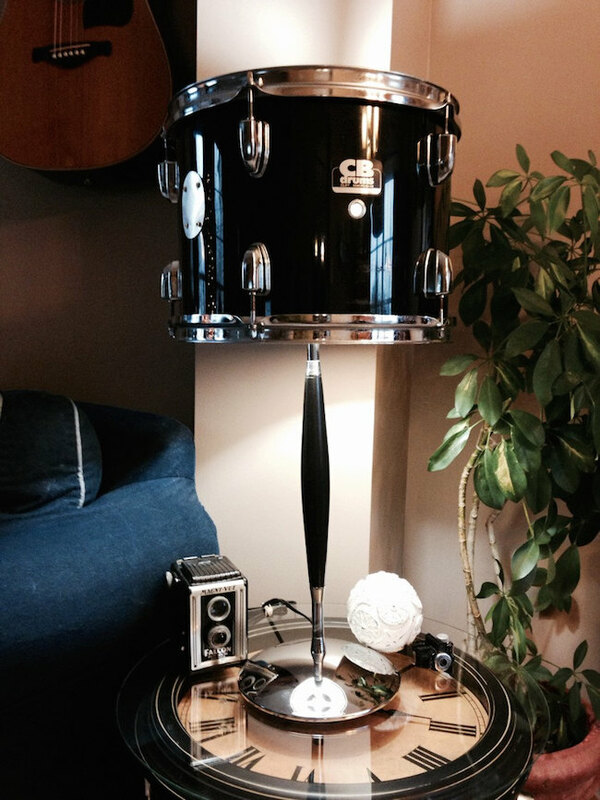 Old drums are just one of those things. 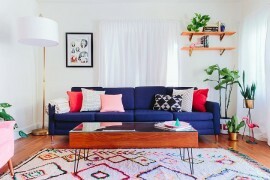 They come in all sorts of different colors and sizes, so finding one that works for your home decor project shouldn’t be all that difficult. 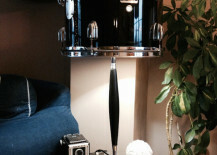 And since it’s not exactly typical to see a musical drum in someone’s home, it can serve as a really interesting focal point. 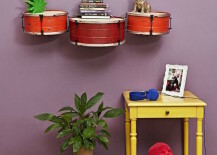 Here are some cool ideas to take inspiration from if you love the idea of using an old drum in your own decor. 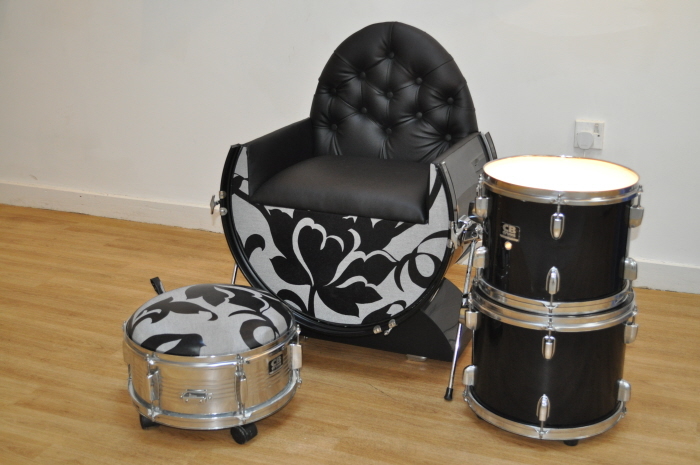 Did you know that you can turn a bass drum into a chair? 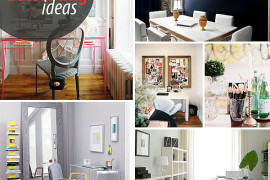 With some handiwork, you definitely can. 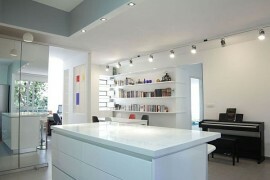 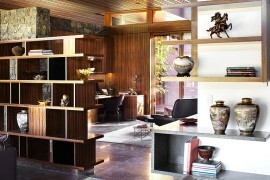 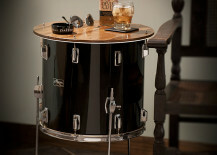 A set of drums featured on Coroflot was turned into a chair, an ottoman and a small side table. 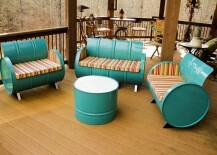 Check out these 55-gallon turquoise steel drums from Home Crux that were cut and turned into a patio set! 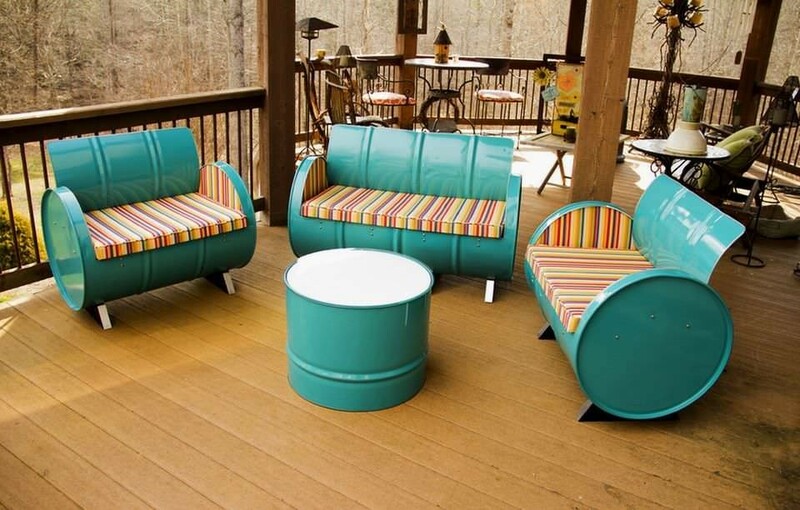 With some funky colored cushions, they’re now comfortable enough to lounge in. 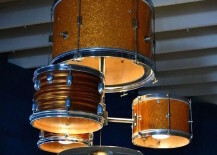 Thanks to their shape and the fact that they’re already hollow, drums can make some pretty unique lamp shades. 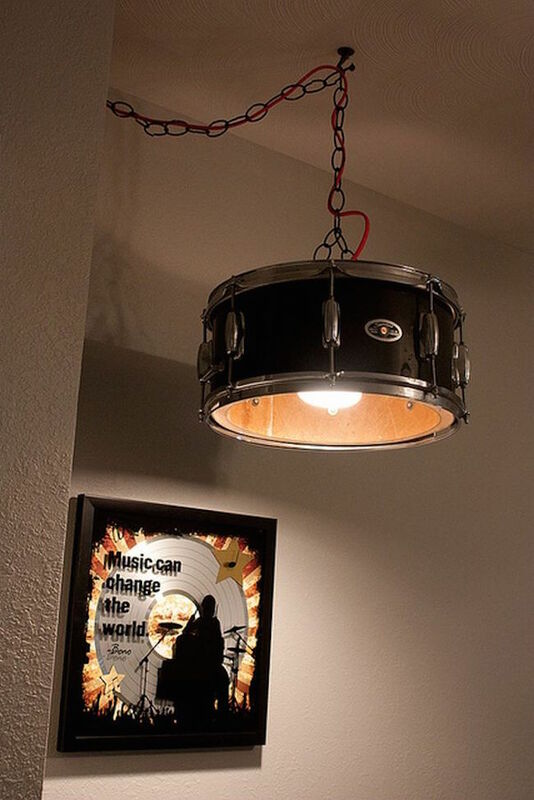 Check out this cool-looking lamp from Music As Art By Sarah on Etsy. 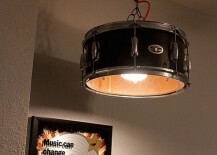 Homedit even featured one on a ceiling lighting fixture. 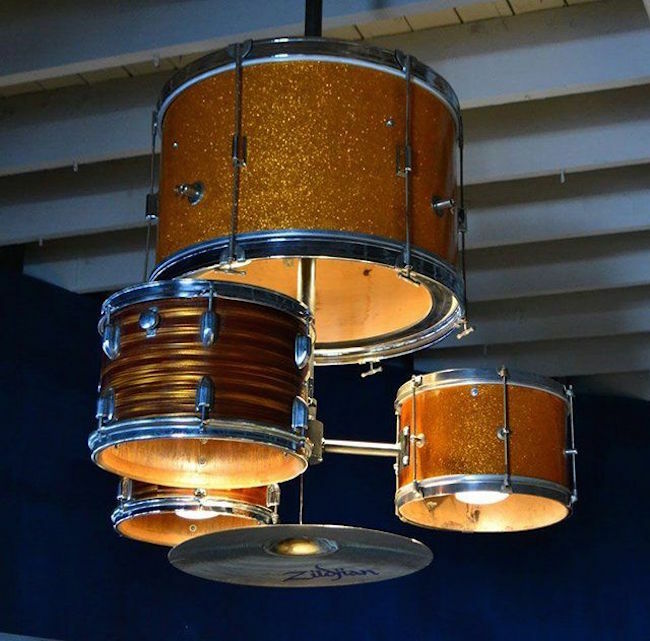 If you like the lamp shade look, why not take it up a notch with a chandelier made from a complete drum set?! 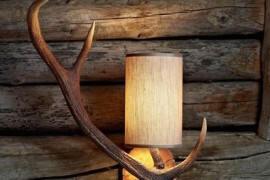 Laughing Squid has the story of how this one was created. 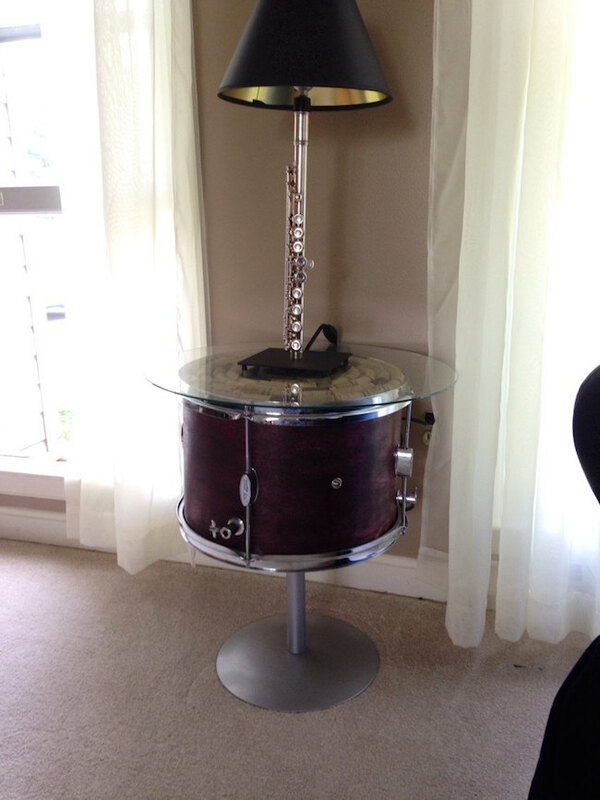 Bass drums are big enough to work as functional coffee tables. 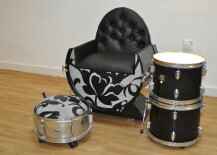 The beautiful drum in this living room by Sarah Richardson is definitely the thing that first catches your eye! 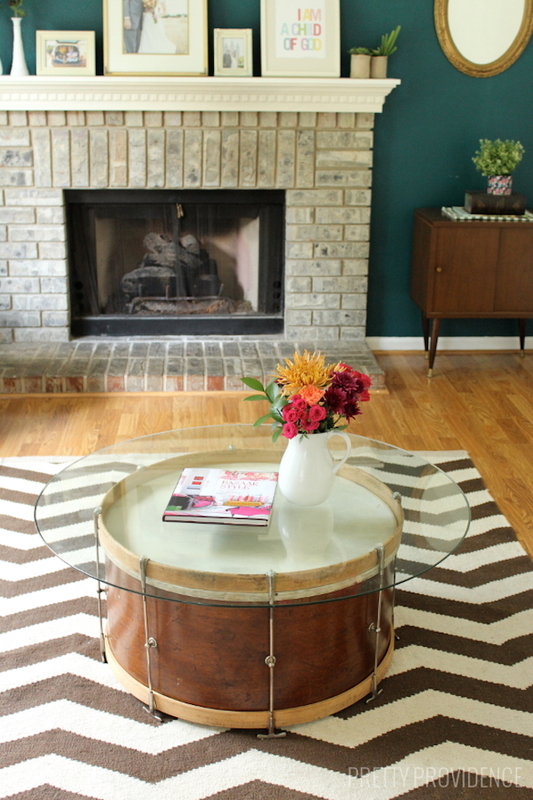 Or you may want to add a glass tabletop to it to make the surface more stable, like this drum coffee table featured on Pretty Providence. 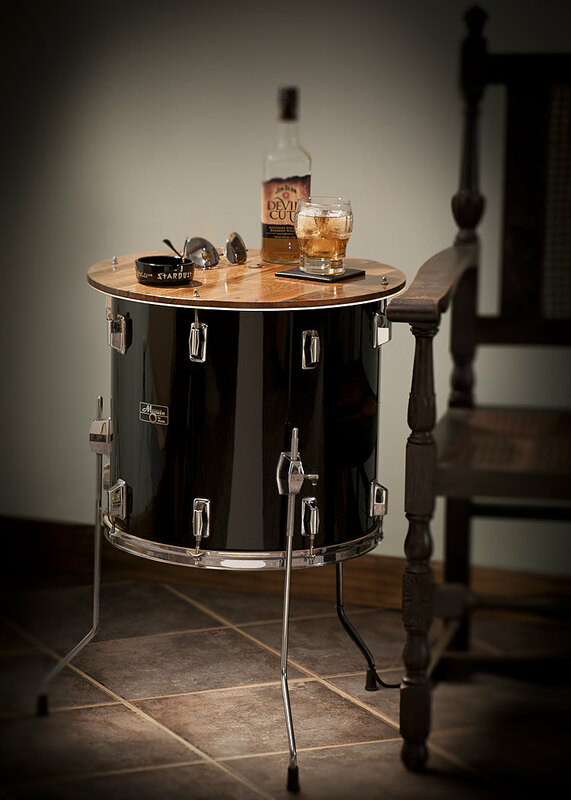 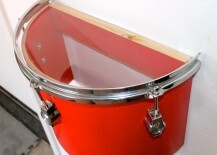 Smaller drums can be used as side tables in the living room or bedroom. 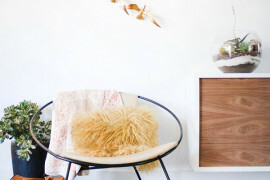 This one from Renovavit on Etsy adds some untreated pallet wood to make it look and function better as a table. 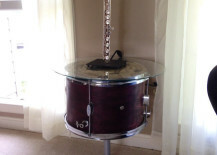 Another upcycled drum creation from Music As Art By Sarah takes a drum and puts it on a stand with wine corks under a glass tabletop. 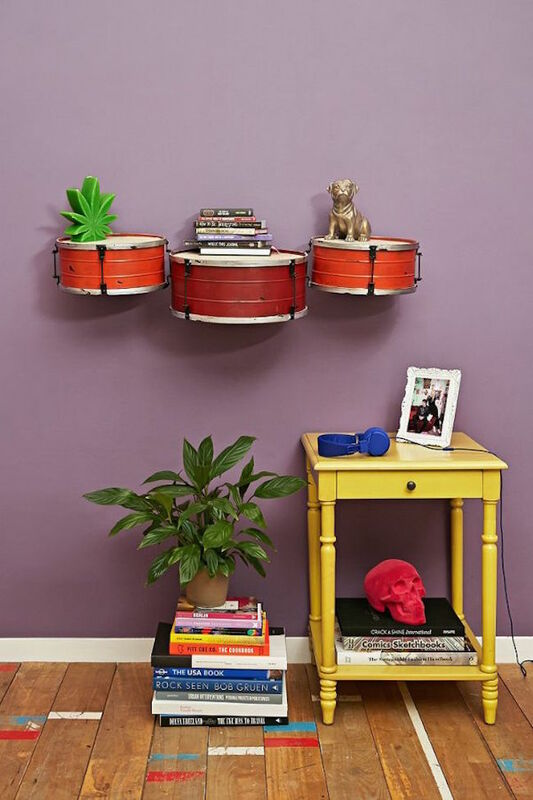 These might be decorative drums, but nonetheless Homedit revealed how you can hang some small ones on your wall to act as shelves while also serving as an interesting form of wall art! 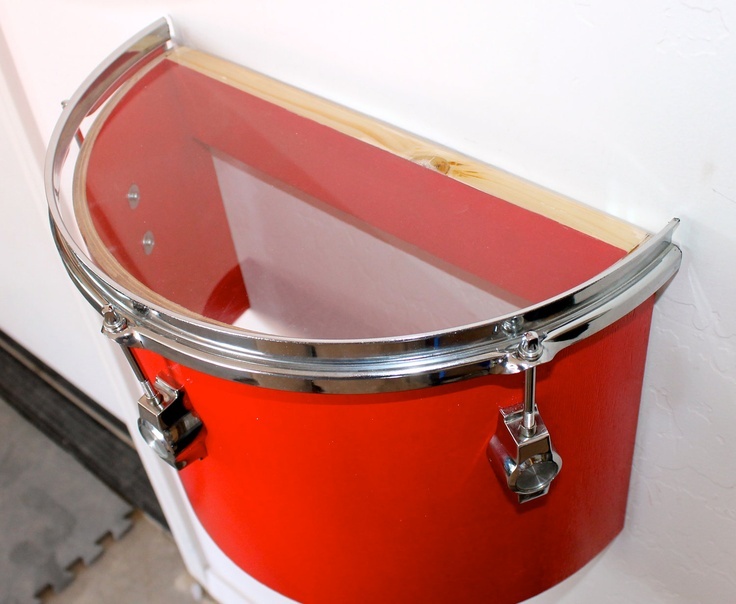 Coryells Craft Corner on Etsy sold these great half drums to be used as shelves. 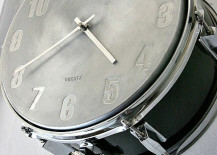 They’re unavailable right now, but perhaps that could change in the future. 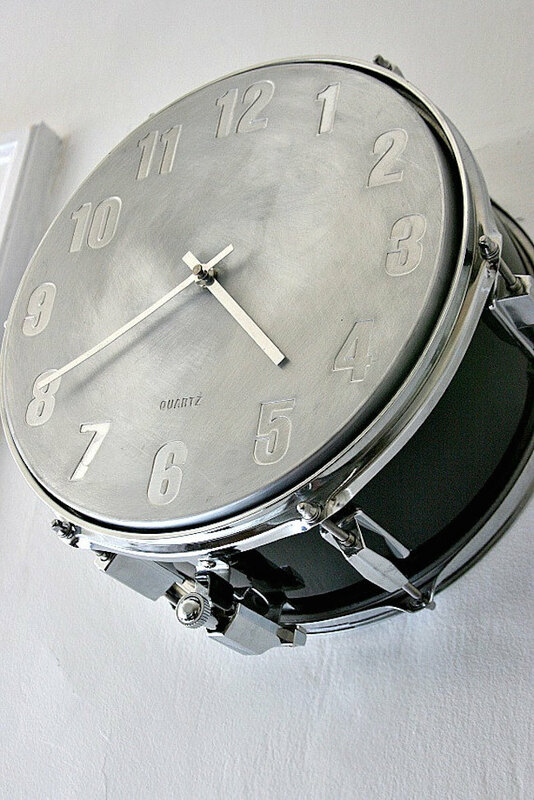 Snare drums that have less depth to them make perfect wall clocks! 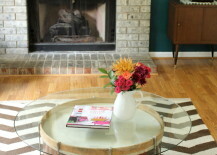 Check out this gorgeous example that was sold by Etsy shop LetsGetThisOverWith.